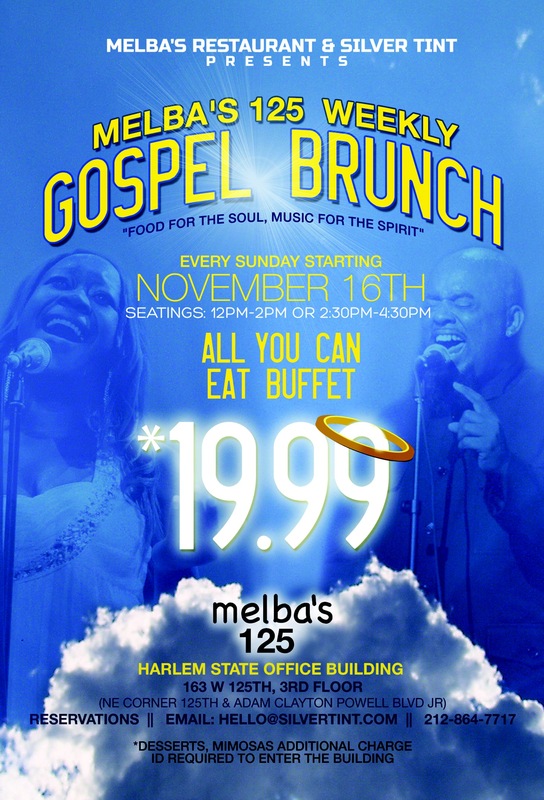 Melba’s Restaurant in Harlem to host Sunday gospel brunch on 125th Street | HarlemGal Inc.
We just learned today that Melba’s 125, same owner as Melba’s Restaurant, will be offering all you can eat buffet Gospel Brunch in Harlem, every Sunday starting November 16th. For only $19.99, guest will enjoy good food and music. Melba’s 125 is conveniently located at the Harlem State Office Building, which boasts a panoramic view of the historic 125th street shopping district. This entry was posted in 125th Street, food, Frederick Douglass Blvd., Harlem, Harlem bloggers, Harlem blogs, Harlem businesses, Harlem Restaurant Row, Harlem restaurants, HarlemGal, Melba's Restaurant Harlem and tagged Harlem, melba's restaurant in Harlem. Bookmark the permalink. Would I have to make reservations for five people this Sunday May 3rd.